Finally a way to keep all of your goat care needs and records all in one place! Do you work full time and run your homestead? 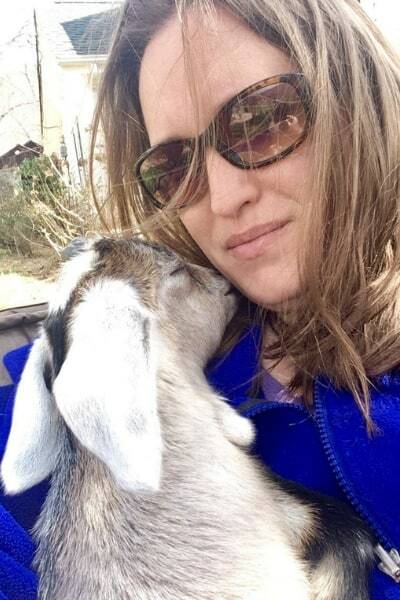 Do you have kids, a home, and life to juggle in addition to caring for your goats? Are you sick of wasting time looking up symptoms, dosage information, and other care information again and again? Are You Ready to Save Time and Energy and Finally Kick the Overwhelm that Comes With Caring For Your Goats? Introducing The Busy Homesteader’s Goat Management Binder! 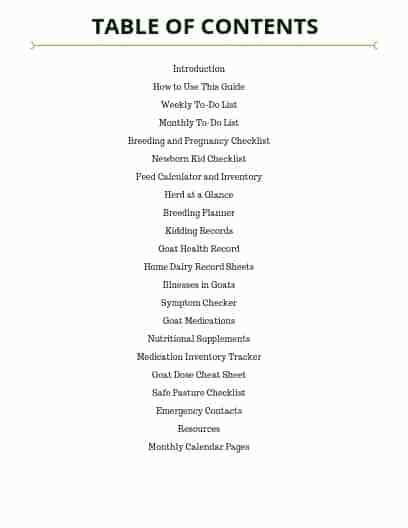 I’ve been helping busy homesteaders learn more about goat care since 2013, and since it’s release in 2017 the Busy Homesteader’s Goat Management Binder has helped over 1300 people tame the chaos and streamline all of their goat care! Like most of you, I am busy! I’ve got 6 kids. We homeschool. My husband works over 60 hours out of the house every week. I work from home running 2 side businesses. There’s the house-and barns- to clean. Meals to make- and screaming goats to feed. Kids to bathe- and hooves to trim. And…. well you get the picture. There are only so many hours in the day- and prioritizing and organizing is the only way to make the most of those hours without going crazy! So, if you are like I was- overwhelmed and overworked- and looking for a way to simplify your barn chores so that nothing gets forgotten and no time gets wasted. 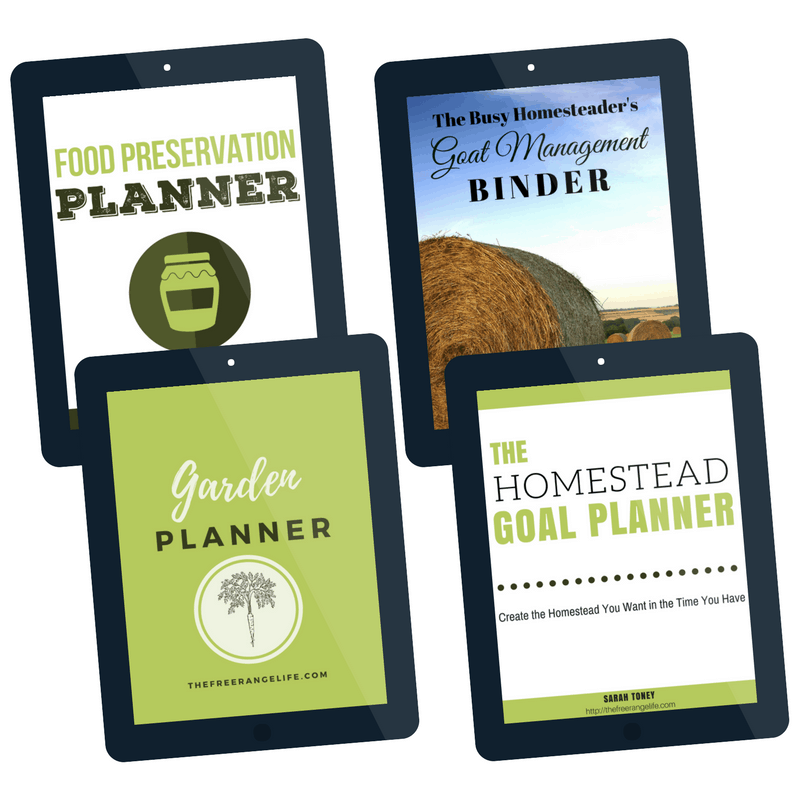 You will love The Busy Homesteader’s Goat Management Binder! Just a quick note to say thanks! I love the Goat Management Binder and as you can see, so does Gus one of our ND Goats! I just bought and downloaded the goat management binder. Holy moly!!! I love the checklists…I mean who wouldn’t. But all the diseases, symptom troubleshooter, medication dosages. Seriously! I am in love and just wanted to make sure you knew that you made an awesome product!!!! 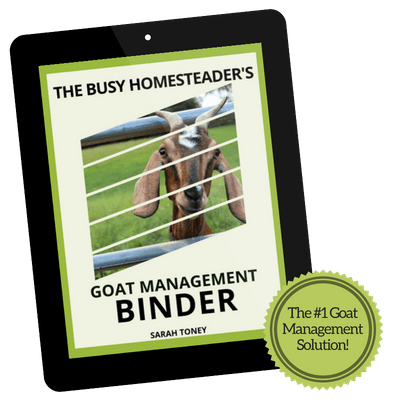 The Busy Homesteader’s Goat Management Binder is a digital resource guide that is perfect to print out and keep in a binder with all of your other goat information- such as your registration papers. Here’s a peek at just a few of the pages you’ll find inside. Do you find it hard to remember to trim hooves? Give copper supplements? Refill the mineral feeders? The Weekly and Monthly to-do lists will help you get it all done. Plus a Breeding and Pregnancy Checklist to ensure a healthy pregnancy and a Newborn Kid Checklist to help you be prepared for kidding and caring for your new babies. Do you need help remembering when the last vaccinations were given? The dates you bred your does? How much milk your doe gave last year? 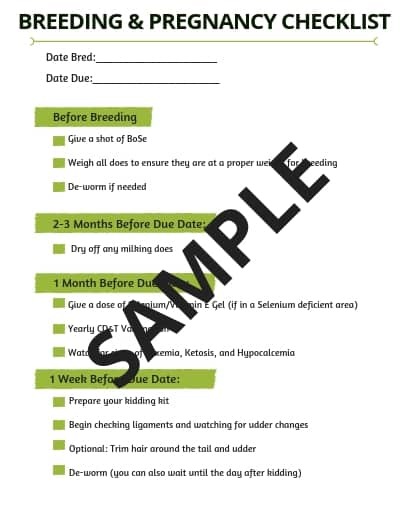 You get herd record sheets to keep track off all medications, supplements, breedings, etc. and the blank calendar pages give you a place to organize your care so nothing gets forgotten. 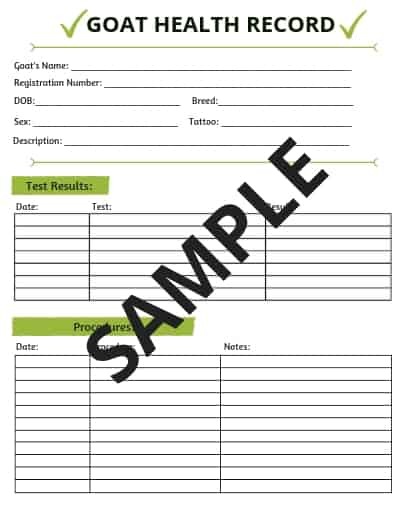 Plus you get home dairy record sheets and an emergency contact sheet so that all your information is at your fingertips. Are you constantly running to your books or google to find out what this symptoms means? What the dose is for a certain medication? If that plant is poisonous? I give you a ton of resources so that everything is right there in one place. 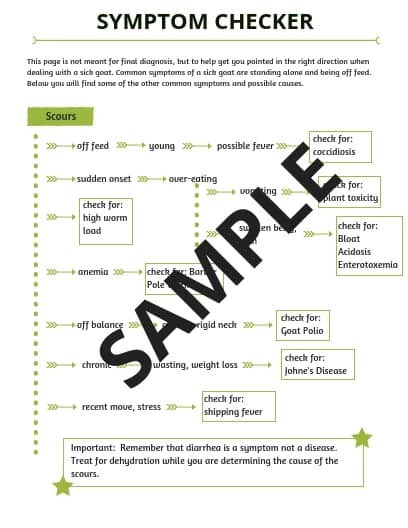 A listing of the most common goat illnesses plus a dosing sheet, symptom checker flowchart– means you can diagnose problems and treat them FAST. The medication and supplement list tells you what to keep on hand so you don’t have to run out to the store in an emergency. If you’ve made it this far, you might still be on the fence. But if you are still here that tells me you need something to change. That you feel overwhelmed or disorganized when it comes to the care of your goats. The Busy Homesteader’s Goat Management Binder will help with just that. I can’t make you click that button, but let me ask you this. How much is your time worth? How much is your sanity worth? For $17 you get a tool you can use to streamline the goat part of your life. So click below- your time is worth so much more than $17.